Oil on canvas, 82 x 61 cm. Holger Roed’s youth portrait of the musician, composer and conductor Frederik Rung is a repeat of his father’s portrait of the same person. 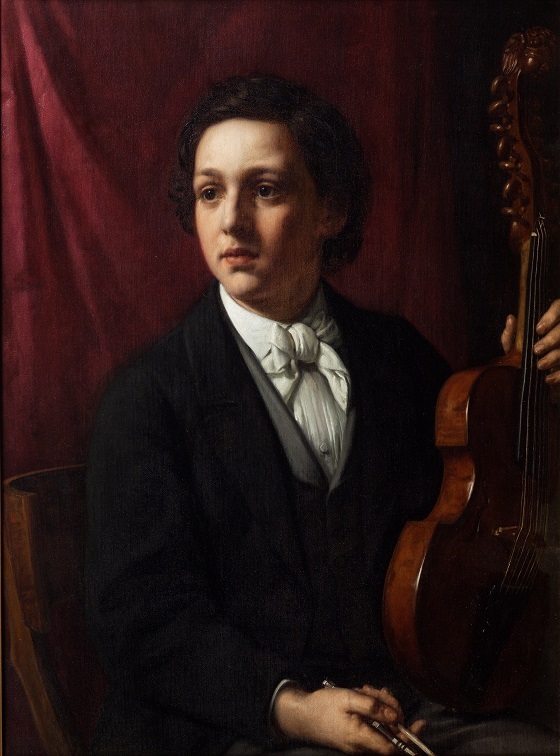 In both portraits, the young man is portrayed in a distinguished fashion, with a viola by his side and a dark red drapery in the background that could be mistaken for stage curtains. The original portrait was completed while Frederik Rung was still a student at the Royal Danish Academy of Music. Three years earlier, Rung had been admitted into the academy at the age of 13, making him the youngest student there. Prior to his admission he had already been hired to play the mandolin, guitar and viola d’amore at the Royal Theatre of Copenhagen. In his later career, Frederik Rung was acknowledged as an uncompromising composer and conductor who helped compose several major operas and concerts for the Royal Theatre and the Cecilia Society, which was founded by his father.